Can I Use Clicker Training with My Horse? Happy horse, happy woman - Rewards of clicker training. The answer to the first question is yes! Clicker training is all about using rewards, and horses love to work for them. The clicker noise is made, then a reward is given. Horses quickly come to expect the reward whenever they hear the clicker. Horses easily learn sequences in order to know what happens next, so you don't even need a clicker, any perceptible signal that comes right before the reward will work. Two: What you click is what you get! The horse has learned that 'click' means reward; their gut feeling is 'click' IS 'reward'. Exactly what your horse was doing when they heard the click is remembered. They repeat that behavior to see if you click and reward again – it's that powerful. This also means that once the horse knows what to do and when, the clicker is no longer needed. You are then free to vary the reward, just remember, the reward is in the eyes of the beholder. That 'feel good' factor is rapidly linked to everything about the training session: venue, trainer, everything else they noticed. This makes people more attractive to horses. Horses see people coming and want more rewards. They can get into an excited state of eager anticipation – just as during those fun, first sessions. While it may be flattering, it can quickly lead to problems. What you click is what you get. Horses who heard the clicker when they were excited tend to get more excited, horses who heard it when they were calmer stay calmer. To preserve calm, teach a 'start' signal, begin when the horse is calm, click when the horse is calmer, and quit while you're ahead, even for just a short break. I adopt a 'learn to earn' program: Horses have to be calm and relaxed when I initiate the session. I begin by calling their name and say 'ready?'. I then click and reward whenever the horse is calmer, especially in the beginning. To help achieve calmer behavior I focus on my own out breath and relax. Horses are herd animals and behavior is contagious, often they will mirror my attitude. I also use low sugar, high fibre food that needs chewing. Chewing produces endorphins and helps with relaxation. Additionally a good wither rub relaxes, and can be more appropriate and effective than food when a horse is fearful or too excitable. Once I've rewarded a response a few times I 'finish' – holding up my empty hands. Then I just hang out. When my horse mirrors me and does the same I either leave, or begin again. Some horses are pushy or even aggressive around food. This doesn't mean that they can't be trained with it, but it does mean care should be taken. The rules about being calm are doubly important. To avoid sending mixed messages by punishing unwanted behavior, I use a barrier – the fence or stable door. Then I can ignore unwanted behavior and focus solely on rewarding what I do want. When the horse has relaxed and gained confidence I lose the barrier. Standing shoulder to shoulder with the horse also makes it harder for them to nudge or bite. Horses learn quickly, a lot will be remembered with just half a dozen consistently timed clicks and rewards. Short study breaks, where I just hang out or take them for exercise allows some reflection and improves performance. There are many ways of using rewards in training so it's worth doing some reading e.g. 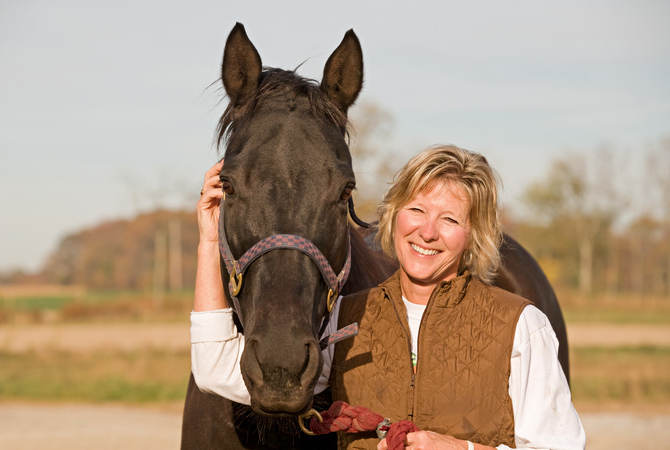 Karen Pryor's, Don't Shoot the Dog and Shawna Karrasch's, You Can Train Your Horse to Do Anything! : On Target Training Clicker Training and Beyond . Helen Spence's blog. I have a short introductory book on Kindle and there is also YouTube, but nothing beats a good trainer on the ground. 'Capturing' is where the exact behavior is rewarded. 'Shaping' is where successive approximations of it are rewarded until the horse 'gets it' e.g. stopping, stopping nearly square, then only square halts get rewards. 'Targeting', where horses learn to touch a 'target' (often a hand held item) with a body part, then it's used to train something else e.g. jumping. Six: Use pressure and release training mixed with clicker training. Any application of aversive pressure needs a 'warning signal', so the horse can take action before the pressure starts. To work, pressure must be released when the horse responds. When horses respond to warning signals alone, they become more willing when a pleasurable reward is added to their effort, e.g. click and reward the correct responses. For this to be successful, warn the horse of any pressure, keep it minimal and non-escalating. The horse will pay more attention and place higher value on the reward, and less on the aversive pressure. When horses fail to do this, conflict between fear of pressure and anticipation of pleasure causes problems.